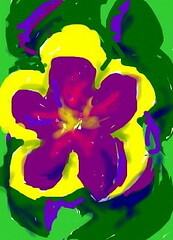 A few days ago (March 27 to be exact), I posted a digital sketch of a flower that I drew on my son's iPod touch. I have been wondering how it would look as a pattern. So tonight I opened the sketch in Painter and "captured" it as a pattern. Then I used the paint bucket tool to fill a new image, then cropped it and here it is. Yesterday I was getting ready to make Charoset for Passover. (Recipe follows). I washed six apples and put them on the cutting board. I was about to cut them up for the food processor, but realized I was admiring the way they looked, so I stopped to take a picture. 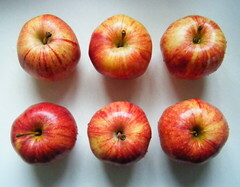 In the photo you can tell that the apples are still wet. Tonight I cropped the image and here it is. About Charoset: it is a food used for Passover Seder, but it is delicious so I make a lot. There are lots of ways to make it, but I make it Ashkenazi style (Eastern European): six apples, about a cup of slivered almonds, in food processor to chop. Add a tablespoon of cinnamon, and about 1/4 cup of grape juice to sweeten. You can add a little sugar (or other sweetener) or a little Manischewitz if you like. Sometimes I add a tablespoon of wine to the grape juice to give it a richer taste. 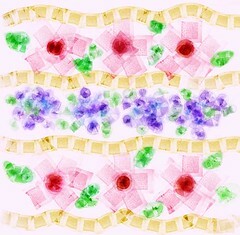 Last year, I made a digital image for Passover using a matza pattern with Painter's pattern pen. 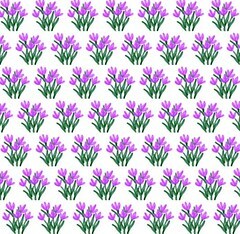 (It is called "Matza Flowers," posted April 11, 2009). I thought about doing something similar this year, but my matza pattern had disappeared, along with all my other patterns, when I upgraded to Painter 11. All my images are intact, however. Perhaps sometime I might figure out how to recover the patterns, but it is so easy to capture a pattern that I decided to just start over. 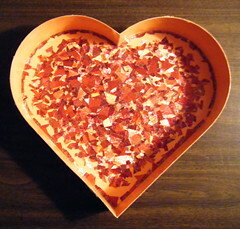 So yesterday I found my matza photo, the one that I had used for the pattern. It is called "Matza (Posterized)", and appears on this site on April 25, 2008. Then I opened the image in Painter and in just a second or two, I had my matza pattern back again. 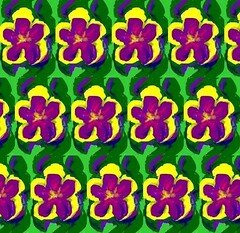 So I used the pattern pen to create this little floral image, a variation on the same theme I used last year. Well, I am glad to have my matza pattern back and I am sending this little image out to wish friends and family a Happy Passover. It has been a busy week, but I did take some time to work on this project. 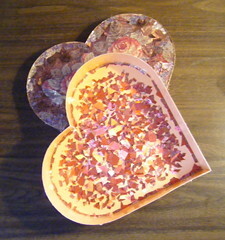 This is a heart-shaped box that I am covering with decoupage and collage made from printed metallic ribbons. This is how it looked on March 25, which was the last time I worked on it. This is the interior of the box. It might be hard to see progress, but in fact I am bringing the red ribbon closer and closer to the outside edge of the heart. Here is another digital sketch that I drew last night on my son's iPod Touch. He had downloaded two paint programs (trial versions) and so I had a chance to try out both of them. 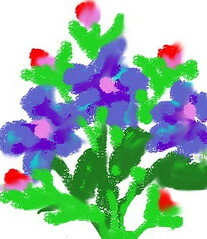 The sketch that I posted last night (Little Digital Bouquet) was done with "Doodlebuddy" and this one was done with "MyPaint Free". I also used iPhoto to crop this image, but otherwise this is the sketch just as I drew it on the iPod Touch. Last night, my son let me try out a painting program on his iPod touch. I drew this little digital bouquet and I had a great time! I liked drawing on the tiny screen with my fingertips. The program even has a blend or smudge program (which I overused). Even so, I liked the image enough to want to keep it, so my son sent it to me. Today I used iPhoto to crop the image and to clean it up just a little. This is another photograph that I took during yesterday's walk at Long Hill Gardens here in Beverly, MA. I was surprised to see these flowers in bloom. They are among the first flowers to bloom, like the crocus. I believe they are a kind of forget-me-not. Anyway, I call them "little flowers that look like purple stars." Tonight I edited the photo to get this composition. Tonight I used my Painter program to create this digital woodcut from a photo that I took this afternoon at Long Hill Gardens here in Beverly, MA. The day was sunny and dry (finally) but it was cold again, cold enough for a winter coat. 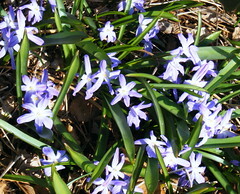 But even though it was cold today, things are already blooming due to last week's warmer temperatures. I saw these little white blossoms growing against the main house at Long Hill. 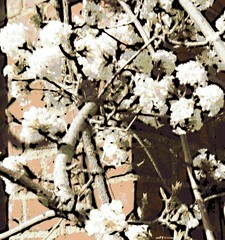 I liked the contrast of blossom and brick, so I took a picture. I thought it would look good as a digital woodcut, so I fiddled with Painter's controls and after way too many tries, got the amount of black outline that I wanted. This is my collage and decoupage project as it looked after I finished working on it today. 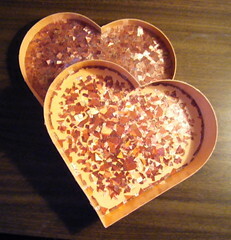 I am using printed metallic ribbon and acrylic medium to create the designs on this heart-shaped box. I have been working on the red area on the floor of the box. This photo shows how the box will look while it is being opened. 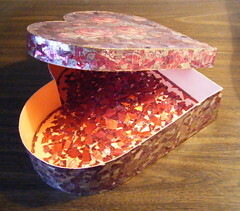 This week, I continued to work on this project, a heart-shaped box that I am covering with collage and decoupage designs created from printed metallic ribbons. This is how the project looked today when I was finished working on it. This photo shows the inside of the box (the part I am working on now) as well as the inside of the box top (already complete). The process is slow, but I can see progress, and I am happy about the way the bright red color looks. This is another image that began at the grocery store! As of this weekend, flowers are now on display outside. 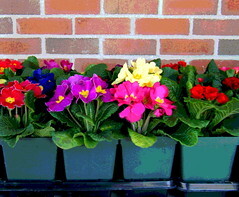 In addition to pansies (see yesterday's post), there were rows of primroses, all different colors, in little flowerpots. I loved to see them all lined up, so I took some pictures. Today I edited the best photo to get this image. In addition to basic straightening and cropping, I needed to do some repair and cleanup, so I used Painter's digital pastel for that. Then I posterized the image, and here it is. On a recent trip to the grocery store, I noticed that flowers were on display outside. This is a sure sign of spring! There were lots of pansies because they do well in cooler temperatures, and even though it was warm today, around here that isn't likely to last. 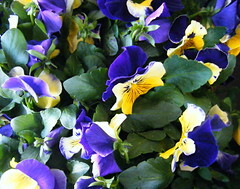 I was admiring a pot of purple and yellow pansies, and decided to take a picture. Tonight I used iPhoto to clean up some stray marks on the leaves and crop just a bit to get this composition. 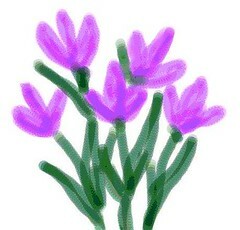 Yesterday I posted a digital sketch of purple crocus that I drew on the computer using Painter's digital pastel. Today I used Painter again to create a pattern from the same little sketch. This what the pattern looks like. Recent rainstorms caused a flood in the basement, so life has been hectic. Today the basement needed to be cleared out for drying. The day seemed so busy and stressful that I didn't think I would have a chance to make art today. But art every day means art every day, so I decided to do a five-minute drawing on the computer. Tonight I sat down and drew this little sketch using Painter's digital pastel. Then I posterized the image and cropped it to get this composition. All done, less than five minutes, but it was five minutes that made a big difference to me. When I find myself thinking that life is too busy and too stressful to make art, that means that I really need to make art! Today I cropped this image from a photograph that I took back in 2004 during a trip to Ireland. 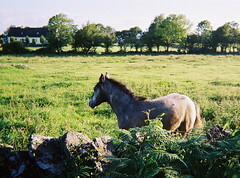 This was taken at a bed and breakfast in Oughterard, near Galway. The setting was beautiful, a little farm right next to Lough Corrib. The ponies were a surprise. They came right over to me as I was taking pictures from the road. They seemed magical to me, like the rest of Ireland. Tonight I did a little bit of work on this project, the heart shaped box, and then took this photo of it, which is a detail of the interior. This view is close enough to show the texture of the printed metallic ribbon that I am using to create the collage and decoupage. 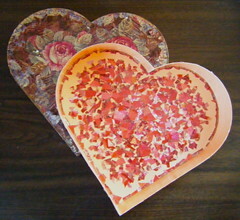 Yesterday I kept going on this heart-shaped box, a collage and decoupage project in progress. 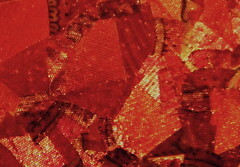 I am creating the designs with pieces of printed metallic ribbon. I continued to work on the red interior, shown here with the top of the box. It might be hard to see progress, but I am getting there. 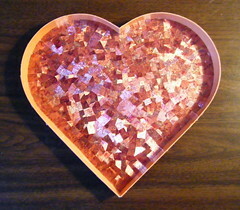 Whenever I get a chance, I continue to work on this heart-shaped box that I am covering with collage and decoupage. The materials that I am using are printed metallic ribbon and acrylic medium, and of course the box itself, which once held a Mother's Day gift from my daughter. Yesterday kept going with work on the red interior, and this is how it looked when I was finished for the day. 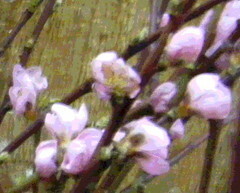 Yesterday, during a trip to Trader Joe's grocery store, I noticed a display of flowering branches with pink blossoms, bundles of them arranged around a barrel. If you live north of Boston, you have to take spring where you find it. So I stopped what I was doing long enough to take a couple of quick pictures. Tonight I cropped this image out of one of the photographs, and then used my Painter program to posterize it. I used Painter to create this posterized version of the image I posted here yesterday, a photo that I took of Boston during a very quick trip to South Station. I drove into Boston today. 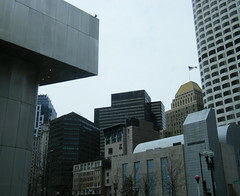 It was a very quick trip, just a South Station run (my daughter was taking the train to New York for the weekend). I couldn't stay and enjoy the city, but before I headed home, I took advantage of two long red traffic lights and took a couple of quick photos. I liked this image because it provides a little glimpse of Boston, much like the drive itself. Tonight I cropped the original photo just a bit to get this composition. I also created a posterized version, which I plan to post here tomorrow. I took a break this afternoon and worked on this project for a while. 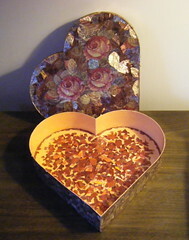 I am covering this heart-shaped box with collage and decoupage patterns created from printed metallic ribbon. This photo shows the top of the box (leaning against the wall), and the red interior, which is what I worked on today. I am filling in gaps with pieces of red and hot pink ribbon. I am working from the middle outward. This gives me a better idea of what this is going to look like. Also, that way if I run out of red ribbon, I may use more gold pieces around the outside edge. Today wasn't quite as warm as yesterday, but fifty degrees was still warm enough for a walk at Obear Park, in the Ryalside neighborhood of Beverly, MA. You can see a bit of Salem across the water. 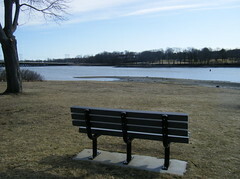 It's a lovely little park, with lots of park benches lined up with a view of the water. Waiting for what, I wondered: boats going by, the drawbridge going up, perhaps summer boating events. But today, it just looked like the park benches were waiting for spring. The weather has been warm for the past few days. 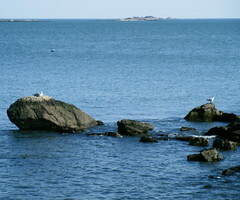 Yesterday it was in the fifties, warm enough for a walk near the beach at Lynch Park, here in Beverly, MA. The park was crowded with people who were taking their kids to the playground, walking their dogs, enjoying the sunshine. Everyone had the same idea, even the birds! I took a few pictures of these seagulls enjoying the warm weather. Tonight I cropped the original photograph to get this composition. 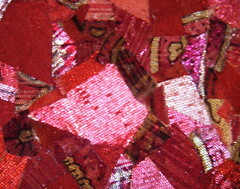 This is a closeup that I took yesterday of my collage and decoupage project, a heart-shaped box that I am covering with pieces of printed metallic ribbon. For this area, the inside of the box, I am going for intense color, predominantly red, with hot pink and pink, with some bits of gold. The pieces are irregular because I am finding bits of color in several patterns. This is slow going, but as I fill in the gaps, I begin to get an idea of how this will look when it is finished. Yesterday and today, I continued to work on this collage and decoupage project. 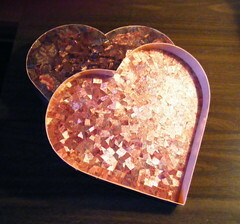 Two days ago, I finally finished the inside of the lid of this heart-shaped box. Now I am working on the inside of the box itself, which is going to predominantly red. I took this photo today after I was finished working on it. It looks like I have a long way to go, but I will get there. This is a collage and decoupage project that I have been working on. 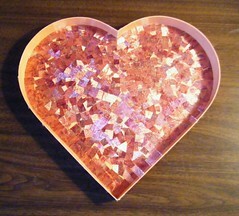 I am covering this heart-shaped box with pieces of printed metallic ribbon. This week I have been concentrating on the inside of the lid to the box, shown here as it looked yesterday when I finally pasted down the last piece of that part of the project. Because the ribbon reflects light, it is hard to see that the surface is completely covered, but trust me, it is. Next, I need to finish the interior. This is my collage and decoupage project as it looked on Tuesday, which was March 2. 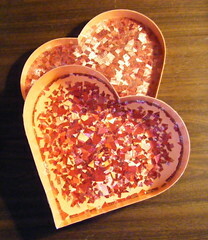 This heart-shaped box once held a Mother's Day present from my daughter. I am using printed metallic ribbons to cover the box with collage and decoupage designs. This week I have been concentrating on the inside of the lid, shown here, which is nearly complete. In the photo, you can also see a little bit of the bottom of the box, which has a brown center and a floral border. This week I have continued to work on this project, a heart-shaped box that I am covering with collage and decoupage made from printed metallic ribbons. This is how it looked as of Monday (March 1). I have been concentrating on the inside of the top of the box, shown here. Although I am getting closer and closer to finishing this part of the project, there always seems to be more gaps to fill in with pieces of ribbon. It is fun to work on this project, and encouraging to see how it catches the light. Here is another image of Witch Hazel from yesterday's walk at Long Hill Gardens. 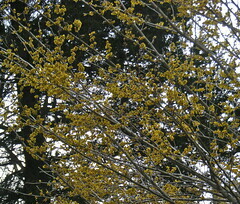 In this view, the yellow blossoms show up against the dark trees and the pale sky. It was great to see some signs of spring on such a dreary day. But that is what the beginning of spring often looks like. It isn't flashy. It is quite subtle and easy to miss: just a slight shift in the light, an almost imperceptible brightening, and just a hint of color. . . . I took this photograph today, during an afternoon walk at Long Hill Gardens here in Beverly, MA. It was drizzling and the sky was dreary, but it was exciting to see these yellow buds, so I took some photos. 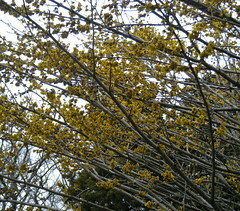 I had thought this was forsythia, but the tree is labeled "Witch Hazel". (When I got home, I looked it up, and apparently the two are often confused.) Tonight I used iPhoto to adjust the contrast and crop the photo to get this image.